If you had discovered the Saddle Ridge Hoard, what would you have done with the coins? Same as "John" & "Mary"
Participate in the PCGS Newsletter Survey and you could win a 2000 $10 Liberia PCGS BU valued at $25.00. Interested in submitting your own survey question? We’d love to see what you can come up with! Email us your question (plus 5 multiple choice answers) and see if your question makes a future eCollector. Perhaps there is not a more closely watched barometer in the coin business than the price of gold. Even though relatively few rare coins are dependent on their bullion gold value, much like the Dow Jones Industrial average has become an indicator of the financial health of the nation, the price of gold has come to reflect the pulse of the numismatic industry. Mike Sherman reviews the interesting price history of gold in the 20th and 21st century. Statistics are particularly important for us at PCGS CoinFacts because the overall size of our website cannot be readily seen. 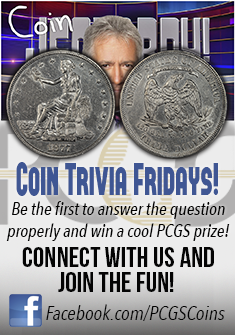 PCGS CoinFacts is not like a physical balloon that expands with each puff of air. Because the viewer can only see one page at a time, it would appear that PCGS CoinFacts is just like it always has been except for regular updating of the population data and prices. As Ron Guth explains, nothing could be further from the truth. Indian Head half eagles, designed by sculptor Bela Lyon Pratt, were minted from 1908 through 1929, the same span as the quarter eagles of like design. The $5 pieces, like their $2.50 counterparts, have the designs incuse, except for the mintmarks on certain issues. The two rarities in the Indian series are the 1909-O and 1929, with the latter being particularly elusive. Although 662,000 1929 half eagles were struck, fewer than 200 are believed to exist today. Most of the pieces were stored by the Treasury Department after mintage, were never released into circulation, and when gold coins were discontinued in 1933 they went to the melting pot. Among Indian Head half eagles, with the exception of 1909-D, and to a lesser extent 1908, most varieties are quite rare in Uncirculated grade, and are very rare in MS64 or better preservation. Get detailed coin information, pricing, population reporting, auction prices realized, rarity and survival estimates and condition census on Liberty Head $20 with a free trial to PCGS CoinFacts. PCGS has photographed a number of high profile collections over the years. But nothing prepared the PCGS Photography Department for the Saddle Ridge Hoard. Not only did this massive collection capture the attention of the general public but it also challenged PCGS Photography in new and unexpected ways. PCGS Lead Photographer Phil Arnold walks you through the Saddle Ridge experience. One of the greatest American coin hoards ever to be found has been acquired by Stack’s Bowers Galleries. The hoard, which contains over a million coins, ranges from bags of large copper cents and Capped Bust half dollars, to Morgan and other silver dollars. Other coins include Washington quarters, Franklin half dollars, bags of Flying Eagle and Indian Head cents, nearly 10,000 1909 V.D.B cents, and more. Most are in circulated grades, and will appeal to collectors seeking coins that are both historical and affordable.